Previously: Johnny Impact defeated Alberto El Patron, Ethan Carter III, and Moose to earn an Impact World Championship title shot. OVE interfered to give Callihan the early advantage. They fought on the floor at ringside for most of the match. Callihan kicked Lashley in the face, but it just fired him up. Lashley hit the spear, but OVE jumped in for the disqualification. OVE continued the beatdown until Eddie Edwards ran out for the save. - At the LAX Clubhouse, LAX played a game of dominos. Konnan is sending Homicide to Mexico City to expand business. Ortiz and Santana will take care of Trevor Lee and Caleb Konley. - In the flashback moment of the week, Braxton Sutter left Laurel Van Ness at the altar for bridesmaid Allie almost a year ago. This resulted in Van Ness’ breakdown. Maria Kanellis, Mike Bennett, Aron Rex, Sienna, and Rockstar Spud were all in attendance. - Allie arrived at the Impact Zone and found a suspicious note from her secret admirer on her luggage. It told her to meet them at tunnel 22. - Backstage, Alberto El Patron attacked Moose for costing him the fatal four-way last week. Rosemary was in control until she missed a charge in the corner. Hania scored a near fall with a spin kick, but Rosemary countered a crossbody into a pin for the win. Hania attacked Rosemary after the match, but Rosemary made a comeback and Hania ran off. - Allie arrived at stage 22 and found a box of chocolates addressed to her. Laurel Van Ness jumped out of a large box, but Allie nailed her with the box of chocolates and stuffed her back in. The faces were firmly in control until Tyrus took over with a headbutt, then the heels isolated Sydal on their side of the ring. Impact got the hot tag and ran wild. Sydal attempted a dive to the floor, but Tyrus caught him and rammed him in the apron. Impact set up for the Impact Kick on EC3, but Tyrus grabbed his legs and Impact hit the mat hard. EC3 rolled up Impact for the win. - Jimmy Jacobs and Kongo Kong went to Joseph Park’s empty law office. Kong trashed the office and smashed a picture of Grandma Park. Cage dominated his debut match and picked up the easy win. - Trevor Lee and Caleb Konley searched for LAX but instead found Fallah Bahh eating M&M’s. They then jumped the Mumbai Cats and beat them down. Fantasma wore down Ishimori until he made a comeback and hit a dive to the floor. Fantasma came back and hit a suicide dive of his own. Ishimori connected with the golden moonsault to the floor. Fantasma attempted the tombstone piledriver, but Ishimori countered into the double knees. Ishimori hit a 450 to retain the X Division title. Aries had the advantage before Drake nailed him with a boot to the face. Drake then missed a huge moonsault, and they traded stiff shots in the middle of the ring. Aries scored a close near fall with a missile dropkick. Aries attempted a dive, but he hit Adonis instead. Drake took over after dropping Aries on the apron. 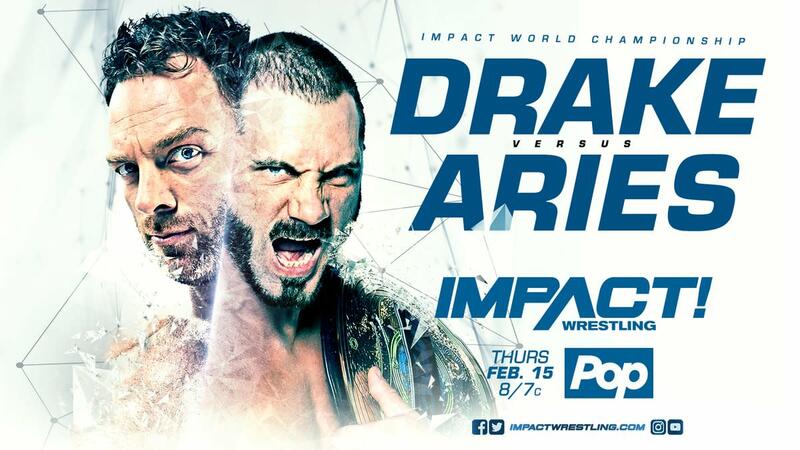 Aries made a comeback and hit the brainbuster to retain the Impact World Championship. Next Week: Johnny Impact defends his World Championship title shot against Ethan Carter III. Plus, Alberto El Patron battles Moose.